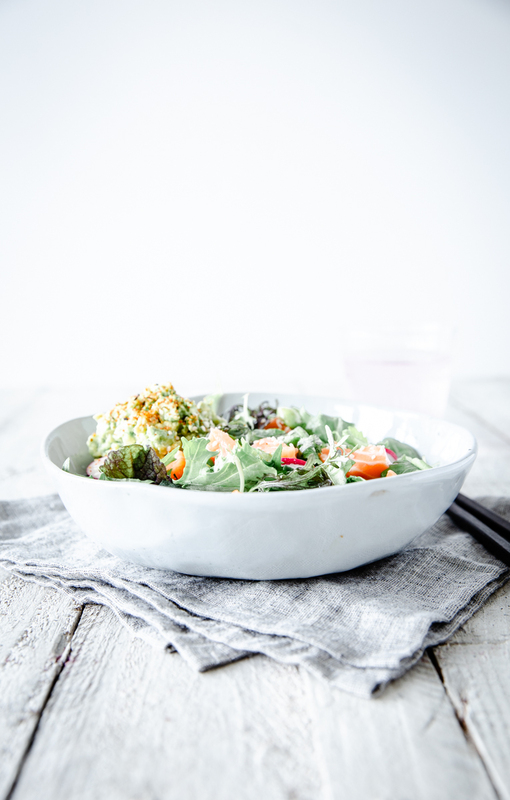 For any who hasn’t come across a poke bowl yet, the best way to describe it is a pimped out salad, usually with raw tuna or salmon, with Japanese inspired condiments. I was a bit late to the poke bowl party myself, but I’ve definitely I’ve made up for it in volume now! Haha. 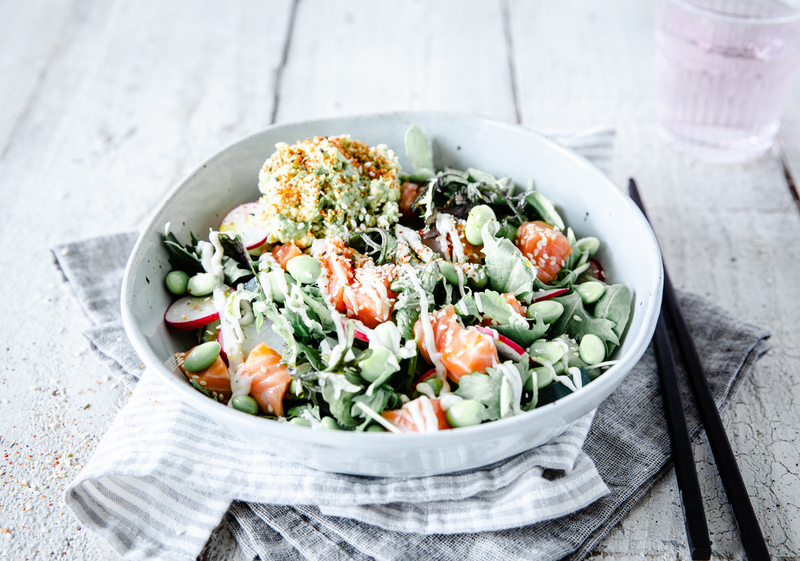 Poke bowls have become our go to meal whenever we want something fast, healthy, and packed with flavour. It also helps that we can conveniently order them from Uber eats. Lately we’ve also been making our own versions at home and they’re no doubt a lot healthier as we know exactly what’s in them, and we don’t use any pre-made sauces which are often loaded with hidden sugars. Poke bowls are an adaptation of the Hawaiian dish Poke, which was traditionally raw fish prepared with minimal condiments such as salt and seaweed. These days Hawaiian poke often comes pre-marinated in a combination of shoyu (soy or tamari sauce), oyster sauce, limu (algae), seaweed, green onions and sesame. 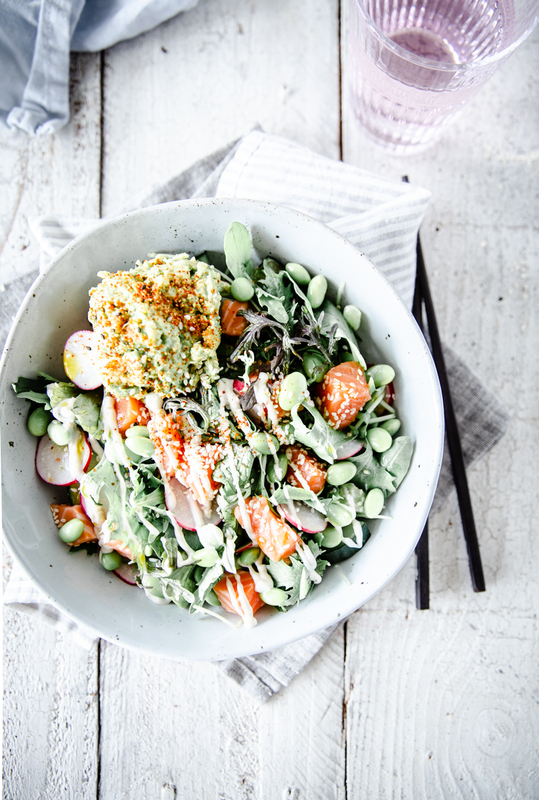 A poke bowl on the other hand, is usually a combination of rice and salad greens, cucumber, avocado, edamame, seaweed and sometimes pineapple, with Japanese inspired seasonings such as siracha mayo, ginger, sesame, crispy onions, furikake or teriyaki. You choose your protein from raw tuna, salmon, chicken or tofu, and they can be easily adapted to suit your dietary requirements or tastes. When we make our own I usually leave out the rice and rotate between raw, cooked and smoked salmon, but that doesn’t mean you have to! If salmon isn’t your thing, substitute it for any other protein of your choice. Likewise with the condiments, get as creative as you like while keeping the Hawaiian/Japanese flavours in mind. I hope this post inspires you to make your own poke bowls, and if you do let me know! Leave a comment below, and be sure to tag your pictures #swoonfood on Instagram or facebook. Enjoy! NB: instead of salmon you could also use raw sushi grade tuna or any other white fish, cooked shredded chicken or tofu/tempeh. 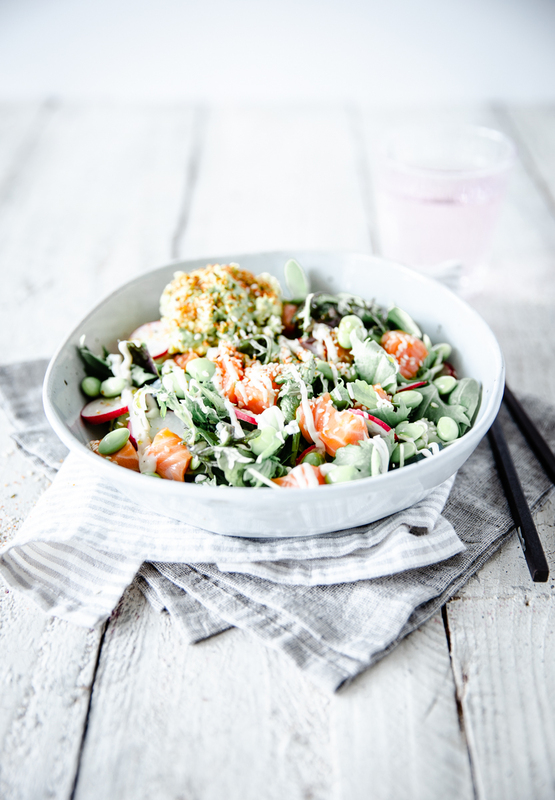 Before you prepare your poke bowl decide whether you want raw, smoked or baked salmon – or one of the other proteins suggested above. If you choose raw fish be sure to buy sushi grade which essentially means it’s fresh in that day. Cut the fish into bite size cubes and either serve it as, is or marinate it using the recipe above. To marinate, simply combine all the marinade ingredients, add the fish and leave it in the fridge to marinate for an hour or so. If you prefer baked salmon, the easiest way to do so is to sprinkle with a little tamari, ginger and lemon, pop into a preheated 180C oven and bake for 10-15 minutes until cooked through. To prepare the poke bowls, if you want to include rice cook 1/2 cup as per the packet instructions. Place the frozen edamame or peas in a small pan, add enough water to cover and bring to the boil. As soon as the water is boiling, drain the beans/peas and rinse under cold water. This stops the cooking process and ensures they retain their green colour. Wash the salad greens and place in serving bowls. Cut the cucumber into bite size pieces and add to the bowls along with the sliced radish and your choice of protein. Open the avocado, remove the stone and mash the flesh with a drizzle of lemon juice, salt, pepper and dash of chilli if desired. Add a generous scoop to each bowl. Top with your choice of dressings and toppings from the list above and enjoy!